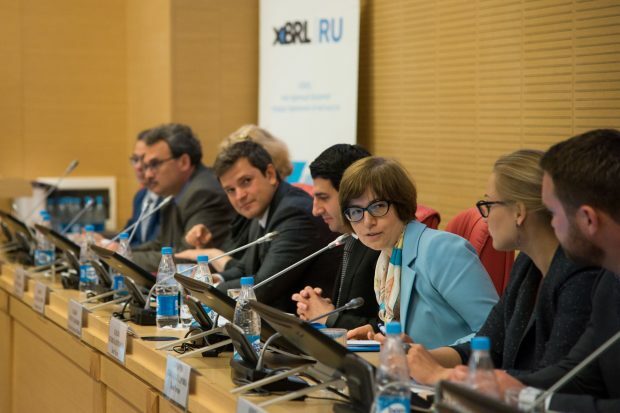 Industry, regulators, software vendors and academia came together last Thursday at Moscow’s Financial University for the official launch of XBRL Russia and the opening of the XBRL Development Centre at the University. With some 700 non-bank financial institutions already filing data to the Russian Central Bank, and a host of other data collections on the way, the event provided an opportunity for the regulator, led by First Deputy Governor Ksenia Yudaeva, to outline some of the objectives of the jurisdiction, which is being incubated within the Bank. In the short term, XBRL Russia will be focussed on data quality on a number of fronts including XBRL software certification as the regulator actively shifts industry towards reliance on commercial software tools, away from template-based convertors initially provided to the finance sector by the regulator. XBRL Russia has launched Working Groups on Methodology, Technology and Communications & Training. Into the medium term, XBRL Russia looks set to work with a range of other agencies, including the Ministry for Economic Development, the Ministry of Finance and the Ministry for Digital Development and Communications. One question is how the XBRL format can be used within a government-wide system for data governance and management. The need for high quality, digital information to support decision-making at all levels of the economy was emphasised by Alexei Kozyrev, Deputy Minister for Digital Development & Communications, who described the significant increase in the use of digital formats for Business to Government filings now sees some 70 billion pieces of information collected across the government. That said, without strong and consistent definitions, and mechanisms to manage data quality, the utility of much of this information is limited. XBRL International CEO, John Turner, was on hand to describe the experience of countries that have worked to develop consistent definitions and the importance of balancing data needs against respondent burden. Encouraging software interoperability, and ultimately leveraging business to government data definitions for use in business-to-business data exchange were all discussed.